Nestled between the Brienzer and Thuner lakes to the East and West, and cradled by mountain ranges to the North and South, the natural beauty of Interlaken, Switzerland makes it a an extremely popular destination for tourists from across the globe. However, some 30,000 visitors do something other than outdoor activities there each summer: they go to a play put on by the community itself, the Tell-Freilichtspiele. Unlike other live theater in Interlaken, in the Tell-Freilichtspiele the players are all amateurs, with most coming from the Interlaken area. Here -- influenced by the Swiss political system where every citizen has a direct say in policy matters -- every citizen can be a direct participant in community theater. The legend of Tell itself reinforces the philosophy of local involvement in theater. The Tell play is put on in an outdoor theater designed specifically for the show. In the story William Tell is a Swiss citizen who is subjected to a wicked Austrian ruler that tried to take control of Switzerland in the 14th century. When Tell refuses to comply, the Austrian, Gessler, has him arrested. Tell may go free on the condition that he use his crossbow to shoot an apple placed atop of his son's head. Gessler's task is torturous: If he misses, he would kill his son and be subject do death by Gessler's hand. However, Tell achieves the feat, and with a second arrow, assassinates Gessler, thus freeing Switzerland from a foreign power. A common citizen achieves a great feat that benefits his community. As Marcel Furer, the Tell-Freilichtspiele's business manager explained, this story became a symbol for both resistance of tyranny and Swiss independence. "This play is made for the Swiss," he said. "Some people still today have the feeling that there is now Big Europe, and Big Germany, and we are alone in the mountains, and don't want to be occupied by a foreign power." 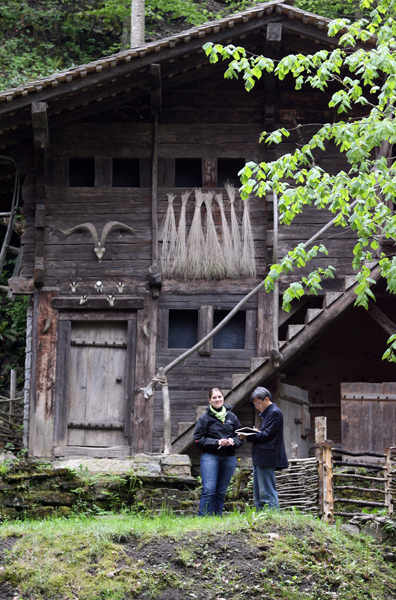 A high school teacher first staged the play in the forest outside Interlaken in the summer of 1912. He used his students as the first players, and at the time, the show was one of the primary tourist attractions. "In the 1920s and 30s, Tell was even bigger than it is today," Furer said. "There were only two things in Interlaken: Jungfrau[, a high mountain peak,] and Tell." 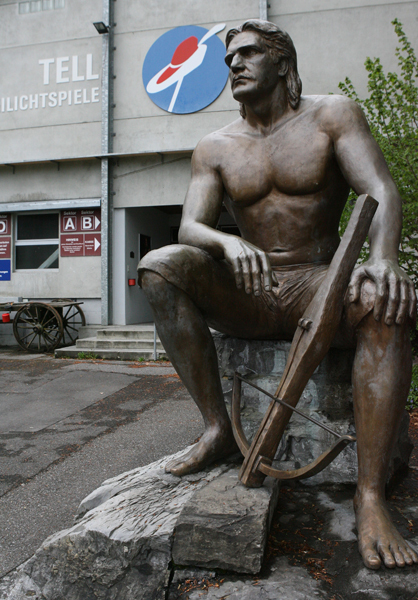 Since then, however, residents of the Canton of Bern have increasingly made this performance, which depicts the legend of William Tell, a Swiss folk hero, their own. The annual re-telling of the William Tell tale has become a massive production, with a cast of about 200 players, 20 horses, 15 cows, a purpose-built outdoor theater, and an annual budget of about 1 million Swiss Francs. There are now 22 shows per summer, each presented in a 2000-seat, outdoor theater designed exclusively for the Tell-Freilichtspiele. It also retains community members for years. "Many people have been involved for 20, or 25, or 30 years," Furer said. "We only have about 10 percent change-over each year for the main roles." He added that more than half of the annual audience comes from within the Canton limits. Seeing other members of the community on stage is a particular draw. "I think this attracts the people, because you can see professional plays in every place, and I think the fact that these are amateurs is something people can identify with, they know it could be them next week," Sandra Schmitz, an actor and assistant to the director, said. During the day, Schmitz, a German national, works in an office writing internal communications. Her real passion, though, is acting. and although she said she was "too old" to be a professional, she participates in the Tell-Freilichtspiele because she loves the work. Schmitz, 35, said there are other benefits to working on the play as well. As a foreigner, she found that working with locals on the play was a good way to get connected with those living around her. The sets are real buildings that have been added to the location in the forest over time. "When you come here, its mostly very difficult even if you are not living in a city," Schmitz said. "[At the Tell-Freilichtspiele] you can meet people, Swiss people, and get a drink after the rehearsal." The production also draws in community members with expertise far removed from acting. An employee of the state radio station in Bern makes the hour-long train journey to handle lighting and sound for the play, Furer said. While the actors themselves, and the vast majority of those involved in the Tell-Freilichtspiele are amateurs, there are a few professionals mixed into the cast and crew. The director, Franca Basoli, has worked professionally in Switzerland and Germany. When she is not directing the play in Interlaken, she is a professor of theater in Zurich. She explained that when running the play in Interlaken, everyone must have a learning-oriented attitude. "There are more women than men who want to participate," Basoli said. "This means some men must stretch -- with three people covering two different roles instead of the standard arrangement of two people per role." Basoli herself also takes a different approach to directing when working with non-professionals. "I often discuss more acting pedagogy, like I do when I'm teaching at the university," she said. This can be a boon for those new to the art, like Maria Theresia. The 24-year-old doctor's assistant has one of the biggest female roles in the show this year -- which will also be her acting debut. For her, this ability for amateurs and professionals to work together embodies the spirit not just of the show, but Swiss democracy as a whole. "Citizens can participate as an actor," Maria Theresia said. "And you have huge gaps between us all -- for example from the age of nine to 80." She also said that the number of different citizens and the educational spirit was a great summary of why so many people participate in the play, and what it does for the community at large. "With this kind of diversity, we can learn how to create a kind of harmony," she said. Every summer, about 200 amateur actors from the Canton of Bern create a world-famous production of the legend of William Tell.